Recently, my wife and I had a small kerfuffle about a television series that she has recently discovered and is actively “bingeing.” The series is Longmire, which tells the story of a gruff, traditional, country sheriff as he investigates crime in the wilds of Wyoming. I have watched some of the series, and like the show a lot, but I have my problems with its format – that is, the “crime of the week” nature of the series. 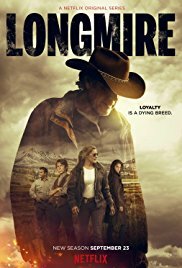 Longmire also has continuing stories about its various characters and I commented that I was more interested in those developments, and could not “buy” the fact that there was a heinous crime being committed each week in the rural county in which the show is set. This discussion led me to conclude that my wife and I watch television to escape, but with different intentions. Neither of these intentions are right or wrong and that can be proven by just examining what is shown on TV these days. For sake of simplicity, let’s stick to TV dramas. There are many enjoyable shows that stick to the same format as Longmire and are worth watching: Bones, The Closer and/or Major Crimes (which expands the crime of the week into a crime of the season), House, Veronica Mars, Dexter. But, for me, these examples stand out due to other notable aspects of the show. Bones has a very interesting dichotomy between its two main characters, The Closer and/or Major Crimes has interesting character development among all the cast, House has its star as a magnetic “force of nature,” Veronica Mars adds an interesting twist by being centered among high schoolers, and Dexter has a central conceit that is ingenious. Others in this format don’t work for me: any of the CSIs or NCISs or their derivations, Supernatural, The Blacklist, and others. 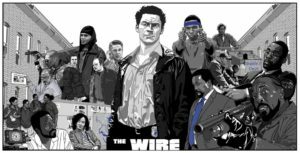 I love television dramas but I tend to gravitate towards those that shatter genre conventions and don’t allow for any redemptions or resolutions each and every week: Breaking Bad, The Wire, The Sopranos, Weeds, Six Feet Under, Fargo. Each of these series takes genre and twists it or bends it beyond recognition. The heroes and villains are not so distinct. There are main characters who you can hate with a burning passion and others you can love without shame. I recently finished bingeing The Wire, so this series is utmost in my mind. Quite simply, this television series is more than a television series, it is a novel, a painting, a textbook, an “empathy machine” (borrowing the phrase from Roger Ebert), a mirror, and a magnifying glass. I could not recommend it more and it enters my pantheon of best television series. I especially enjoyed watching the episodes and then searching out recaps and other commentary on the shows as I watched them. Yes, call me thoroughly fanatical, but if you want to do the same, I recommend the commentary of Alan Sepinwall, which can be found at uproxx.com under the heading of “What’s Alan Watching.” This is one internet blog where it’s even interesting to read the comments! Happy viewing, everyone! Previous story What’s It All About?